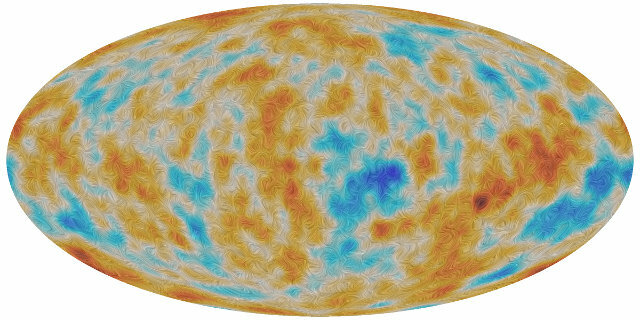 Nearly two years after presenting the best map ever made of the cosmic microwave background radiation, ESA revealed another map created using data collected by the Planck Surveyor space probe between 2009 and 2013. This new map shows the polarization of the cosmic microwave background radiation dating back to the early stages of the universe. It shows that the first stars started forming about 550 million years after the Big Bang, 100 million years later than previously thought. The study of the cosmic microwave background radiation – CMB or CMBR – the residue of the earliest stages of the universe, has been keeping many researchers busy for the past 50 years, since it was discovered. Planck is a special space telescope designed to study the cosmic microwave background radiation. It’s the last of a series of instruments that are more and more perfected that over the decades have contributed better and better to this type of research. Now the data collected by Planck have reserved this new surprise after the analysis of the polarization of the cosmic microwave background radiation. Light gets polarized when it vibrates in a preferred direction, a phenomenon that may be caused by the collision of photons with other particles. This happened commonly at the time when the cosmic microwave background radiation originated. In that remote era, the universe was small and very dense so photons often clashed with electrons, protons and neutrinos, at the time the prevailing matter particles. With the expansion of the universe, those collisions became less and less frequent and among the consequences there was the possibility of protons and electrons to combine without being split by the bombardment of photons. The polarization of the photons is useful because it keeps the memory of the interactions occurred between these light particles and matter particles. Its analysis allows to estimate independently the age of the universe, its expansion rate and the basic composition of normal matter, dark matter and dark energy. The data provided by the polarization of the cosmic microwave background radiation confirm many measurements already performed in various ways but provide a surprise about the time when the stars started forming. It’s the stage of the history of the universe known as reionization, because the light of the first stars interacted with the gas present in great abundance in the universe ionizing it and therefore separating electrons from protons. According to estimates made by analyzing the data of the WMAP (Wilkinson Microwave Anisotropy Probe) space probe, the Planck Surveyor’s predecessor built by NASA, the dark age of the universe ended about 450 million years after the Big Bang. On the other hand, some observations with the Hubble Space Telescope showed that the first galaxies were beginning to form between 300 and 400 million years after the Big Bang. The problem was caused by the fact that those primeval galaxies didn’t emit enough light to cause the reionization. If the reionization had taken place at that time it would’ve been very difficult to explain it only with the birth of the first stars. The new estimate showing that the stars started forming about 550 million years after the Big Bang explains the reionization in a plausible way. This map was created using data collected by the Planck Surveyor’s LFI (Low Frequency Instrument) instrument. Another map is being created using the data of the other instrument of this space probe, the High Frequency Instrument (HFI). It’s expect to confirm the latest findings and provide more accurate information about them but you never know.